As I’ve gotten older, I am stricter about how I look when I leave the house to be seen out in public. Unless I’m heading to the gym or a quick run to the grocery store, I am wearing some kind of outfit that’s been given some consideration with a face with some makeup. But it is hot in Texas, so I don’t like to wear foundation every day. Here is my summertime five-minute made-up face. #2 – Eyebrows – You’ll most likely hear this time and time again on Beautypendence, but EYEBROWS ARE VERY IMPORTANT. (Wendy has especially strong opinions on eyebrow shapes.) Eyebrows frame your face, and if mine are not properly groomed, I don’t feel like the rest of my face looks finished. I use an eyebrow brush to comb them into place, and then I prefer to use powder to fill and lengthen them. With naturally black hair, I find that cosmetic companies make eyebrow powders too light, since they usually come in dark brown for brunettes and no darker. So, I use a soft black eyeshadow – same difference! If Urban Decay ever discontinues their matte eyeshadow in Perversion, I will cry. I then use an angled liner brush to apply the powder. 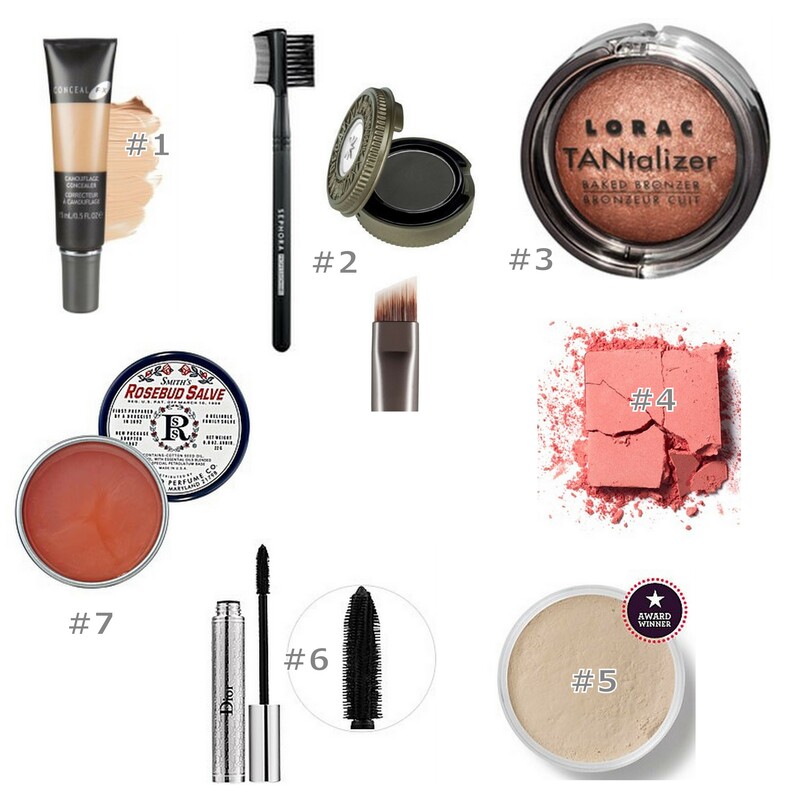 #3 – Bronzer – Using a fluffy powder brush, I apply LORAC TANtalizer Baked Bronzer in the shape of the number “3” along the sides of my face. Start at the forehead, curve down in a “C” shape below your cheekbone, and then curve down along the jawline. Don’t get too crazy with the bronzer, though, or you’ll be a shimmery mess. #4 – Blush – As I discussed in an earlier post, I’ve been feeling Benefit CORALista for the summer. Using a fluffy blush brush, I smile and apply to the fullest parts of my cheeks. #5 – Translucent powder – Even though I haven’t put on a lot of make-up, out of habit, I’ll seal everything up and matte-ify my look with a finishing powder. I use Bare Escentuals Mineral Veil with a very full, dense powder brush. I see that Mineral Veil now comes in a SPF 25 formula, which I’ll definitely try out next time. #6 – Mascara – My lashes are woefully puny (so much hair on top of the head, but not above my eyeballs), so I apply a touch of mascara. I am in LOVE with DiorShow Iconic Mascara. The brush is a plastic comb, which helps prevent clumping, plus it’s a curling formula, so I can give my Shu Uemura Eyelash Curler a rest. It’s not officially waterproof, but I have never had problems with this mascara smudging. #7 – Lipgloss/Lip balm – Lips are last, and I tend to get lazy on this part. I’ll usually just apply whatever lip gloss is in my purse or some Smith’s Rosebud Salve over my SPF30 chapstick. My lips are fairly pigmented au natural, so I don’t require a lot of color. And that’s it! In the photos left and right, you can see that I’ve made-up half of my face, and I think you can see the difference just a few steps in a few minutes make. What steps do you take for your five-minute make-up face? This entry was posted in Vanity and tagged blush, bronzer, concealer, eyebrows, five-minute face, lip balm, make-up, mascara, on the go on September 6, 2011 by jenn. I need to work on this, I don’t have a 5-minute anything. Do you apply the concealer to your eyelids too? Then, I brush from eyelashes to eyebrows with MAC eyeshadow in ricepaper. Its a nice creamy color that brightens the eyes. Then I put a very light brown in the crease to give it depth– don’t know what color by its made by Boots Cosmetics. Unlike Jenn, I have very long, albeit, straight eyelashes (read- I must wait for mascara to dry before putting on sunglasses, or my eyelashes will stick to lenses). But I too user Diorshow Iconic Mascara. I actually read about it on Jenn’s facebook once and love it. I do not get the waterproof, but I don’t think that you need this. When I’m on vacations is other countries, I always stop by a pharmacy to pick up a weird chapstick. Usually one that touts olive oil (or at least that’s what I think it says since usually its not in English). So that’s what I wear on my lips. Unless it’s nighttime, then I’ll use a colored (always a hint of Sparkle) lipgloss- Neutrogena, Chanel or MAC. Wendy – Some of the concealer may get on my upper lash line, but I’m not purposefully applying it to my eyelid. Brittany – Thanks for sharing your routine! I’ve always been curious about Tarte cheek stain. I’ll have to give it a try sometime, especially with all the many shades they carry now. So jealous of your ridiculously long eyelashes. I typically only use eyeliner, eyeshadow, mascara, and lip gloss, but I would love to even out my complexion for special occasions. I am going to follow this routine and see what I think. Thanks, Jenn! Thanks to you, I found my new powder….the mineral veil with SPF. It’s fantastic for just a smidge of evening out and getting rid of shine, but not being overly coverage-y (what? It’s a word.) And I was inspired to find a hand lotion with SPF as well. Found it in Boots No. 7. Keep the tips coming, ladies! Yay! And I think coverage-y is totally a word.